A lot of Pau’s work could have made it into this article. He has a wonderful eye and a superb sense of timing. This photograph offers novelty, humor, and is a great advertisement for good street photography. The image has been seen all over. It’s the first image on his website and often the lead photo in any press coverage he gets – which is a lot! From Barcelona, Pau has also opened his skillset to delivering workshops, where street photographers of all levels can gain key skills and insight into the craft. This photograph is timeless. It could have been taken in any era. If someone said this was one of the first ever color photographs, we would believe them. It was in fact taken in 2016, on the Royal Mile, Scotland. Her vibrant lips, perfectly placed underneath the red metallic structure, make this image such an eye-catcher. Her open mouth suggests surprise, concern, or relief. The image has been featured on the BBC and the front cover of EyeshotMagazine, whilst being highly popular with people who like to purchase prints. Linda has an excellent standing in the street photography community. A seasoned pro who knows what all the important details are. 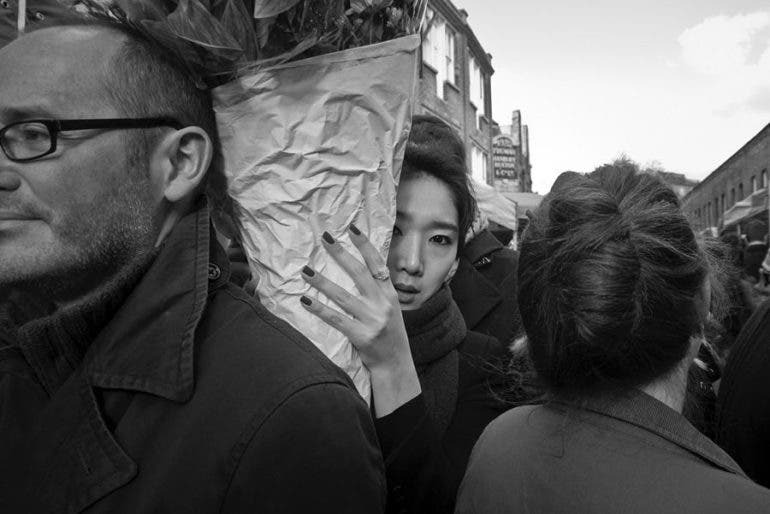 The image has been applauded worldwide and is best described as one of her ‘flagship street photographs’. The subject perfectly tells the story of the hustle and bustle of a capital city, especially around London’s famous flower markets. We would refer to Matt as the Godfather of modern day street photography, however, he may feel we’re implying he is either old or a person into some crafty business he shouldn’t be. He is neither of those things, but he is a major player in the scene – as is this photograph. Just look at it. The composition is perfect, the timing is impeccable and the pigeon, well, actually has its place in this world for once. The photograph has been in galleries, books, and online magazines time and time again. It’s an amazing photo from an amazing street photographer. Street photography has evolved a lot over the past 10 – 15 years. With that, so has the importance of telling a story through an image. This is what makes this image stand out: it’s old school. No fancy lighting or minimalism with a little pop of color – just pure, good old street photography. The classic 99 Ice Cream, the two young lovers and the envious friend – all of it working together to make a photograph that makes us tingle with delight. People can get an education on good storytelling with this one. 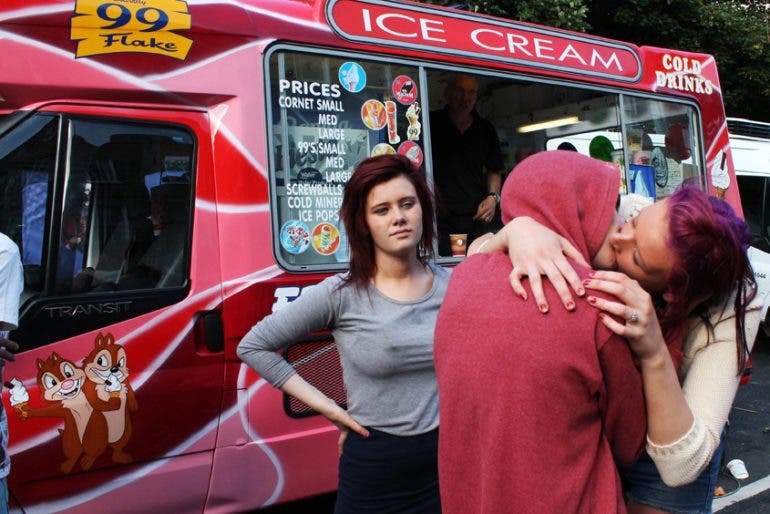 This cheeky photo has been featured in street photography festivals all over. It’s also used as a promotional image to encourage new people to get involved with the festivals. The perfect alignment and contrasting subjects make this photo so instantly recognizable. 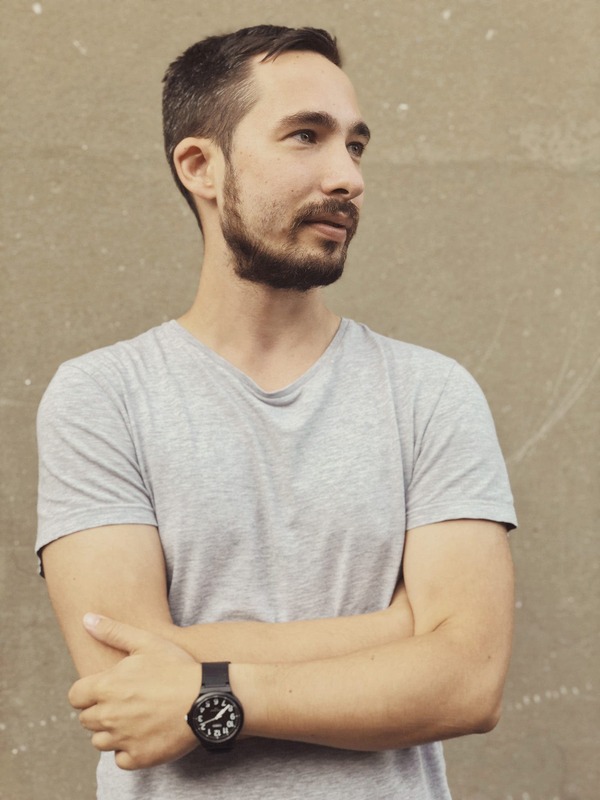 Daniele is a member of the Italian Street Eyes collective. You can see more of their photographers and their work here. 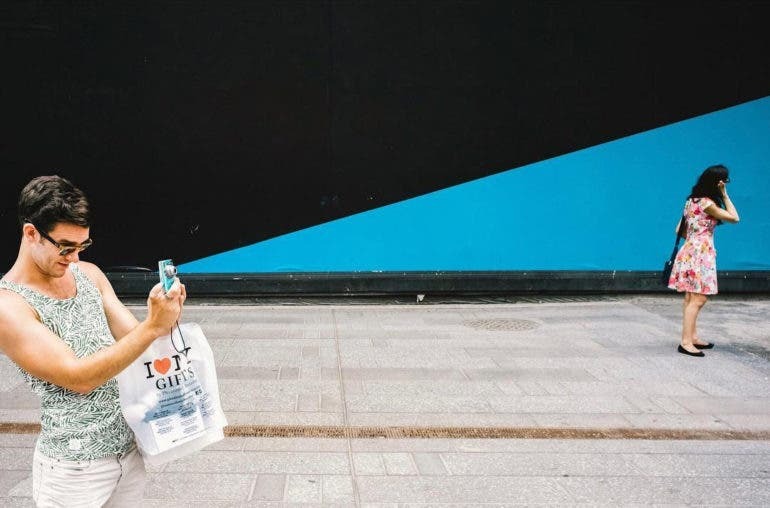 A street photograph that makes you look twice. Your brain can’t quite figure out what is happening. How is this man breaking the laws of gravity? Did he hit the floor? Is the Matrix a real thing now? Questions that need answers. 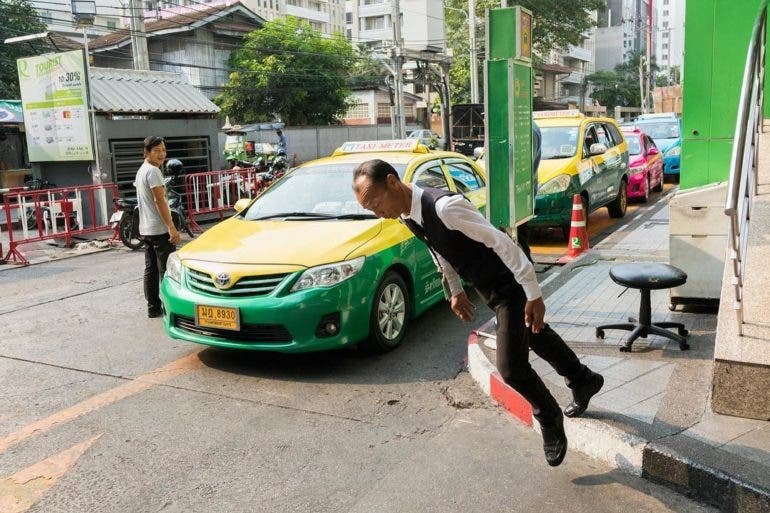 According to Tavepong, this is a regular occurrence in Thailand. “He does it to show off to customers. It’s to try to get them to come into the store,” Tavepong tells us. But before any answers are given, this image is a perfect example of interesting and mysterious street photography. Now before you accuse us of seeing some fake breasts and getting all excited, that’s not what’s going on here. Sure there’s a seediness to this photo but let’s remember there are children involved. This is a good example of both a story and the need to understand rolled into one image. If this was part of 100 street photographs, it would certainly be one of them that stood out from the pack. There’s so much wrong with the scene, yet it still grips you. The child does not want you to know how his family lives, he just wants to eat his food. Sometimes questions are best left unanswered – and in a result of this, the photo should just be enjoyed. 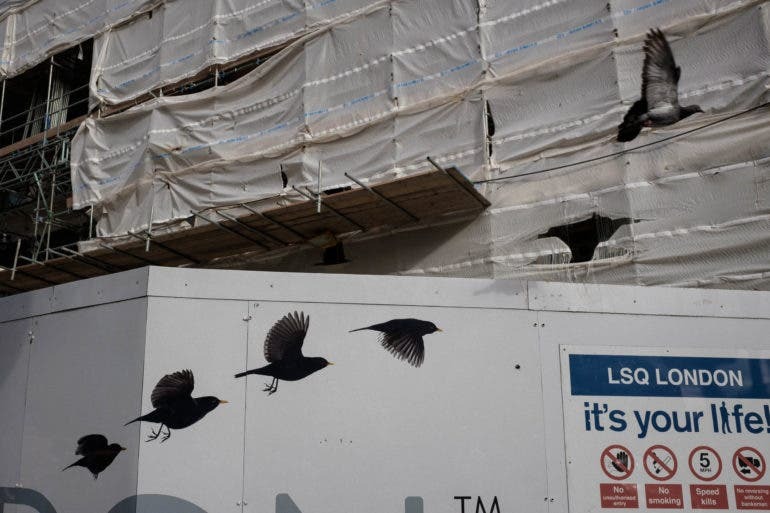 We have featured Jonathan Higbee on the site several times. In street photography, he is best known for his Coincidences series, in which he captures moments that are so surreal they tightly hold your eye. There are many photographs from that series that could be included in this piece, however, the above scene is one that really sticks in our mind. The composition, the lines, and the unknowing subject – it’s the kind of street photograph people dream of capturing. In this one image you can learn about timing, angles, storytelling, color, and compelling art – for that reason it had to be included in this list! You may notice that many of these photos are not necessarily complex. A good eye and some simple touches can go a long way to making a stand-out image. That’s not to say it’s easy; these photographers put in countless hours of walking, shooting, and failure in order to get some success. You’re able to learn a lot from these images and through them can understand what makes a good, solid, and soon to be iconic street photograph.